* Thanks to Jim Smith of NoSacredCows for this computer manipulated photo of Francis gazing upon his favorite painting. It was recently brought to our attention by Pedro, a reader of Call Me Jorge..., that the National Catholic Reporter published a story, Pope's favorite painting returns to Chicago after seven-month exile, which contains some interesting revelations in it. For those unfamiliar with the White Crucifixion, Jorge Bergoglio remarked about it in Pope Francis: His Life in His Own Words in two places. The first, on page 27, was when he was discussing what he believes Our Lord's Crucifixion represents. 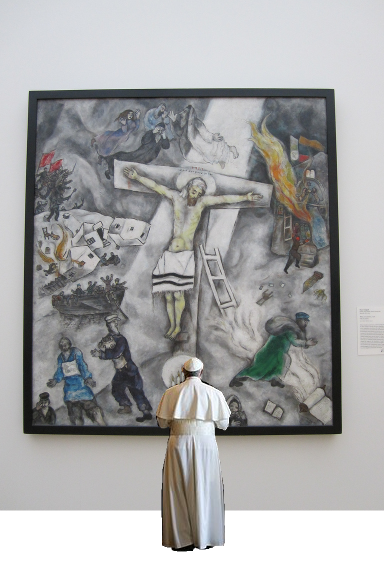 Jorge says, "White Crucifixion by Marc Chagall, who was a Jewish believer, is not cruel but hopeful. Pain is depicted there with serenity. To my mind, it's one of the most beautiful things he painted." Later in the book on page 153 he is asked by the author what his favorite painting is. Jorge replies, "White Crucifixion by Marc Chagall." The best source on Francis' favorite piece of art, the White Crucifixion, is the excellent Maurice Pinay Blog. Some of his most interesting posts on this topic are linked to at the bottom of this entry. ...Under newly consistent light and amid the slick renovation, Chagall's Jesus wears a sort of turban on his head, and instead of a loincloth he dons a Jewish prayer shawl, or a tallit. Surrounding the central crucifixion scene, a synagogue burns to the right, rabbis fly in the air above (where one might expect angels), and a pogrom ensues to the left. Above Jesus' head, on the titulus, Chagall writes the Latin acronym "INRI" and, in jumbled Hebrew and Aramaic, "Jesus the Nazarene, king of the Jews." Whether Chagall, who grew up with extensive Jewish instruction despite the multitude of errors in many of his Hebrew inscriptions, knew that the way he spelled Jesus' name in Hebrew also doubled as the rabbinic acronym "May his name and his memory be wiped out" is debatable. But it's certainly clear that the work "owns" Jesus as a Jew. And as the Art Institute website observes, it aims to "dramatically call attention to the persecution and suffering of the Jews in 1930s Germany." ..."In this painting, Jesus is at the center of some of the most horrific suffering Chagall can imagine," she said. "And he is not just among the suffering, but truly identified as one of the suffering." ..."The appropriation of Jesus as a Jew is an implicit criticism of Catholicism for viewing the Jew as other, for not recognizing one's own suffering in that of the Jews. Taking over Christian iconography is a critical move," she said. "For the pope, the Jewish Christ may be enough to make the point about the failure of the church, and this might well speak to him." ..."The painting comes out of the movement, particularly among Yiddish-speaking, nonreligious Jews, to see Jesus as sharing in the sufferings of Jews at the hands of Christians. However, few, if any, Christians are really aware of this movement," he said. 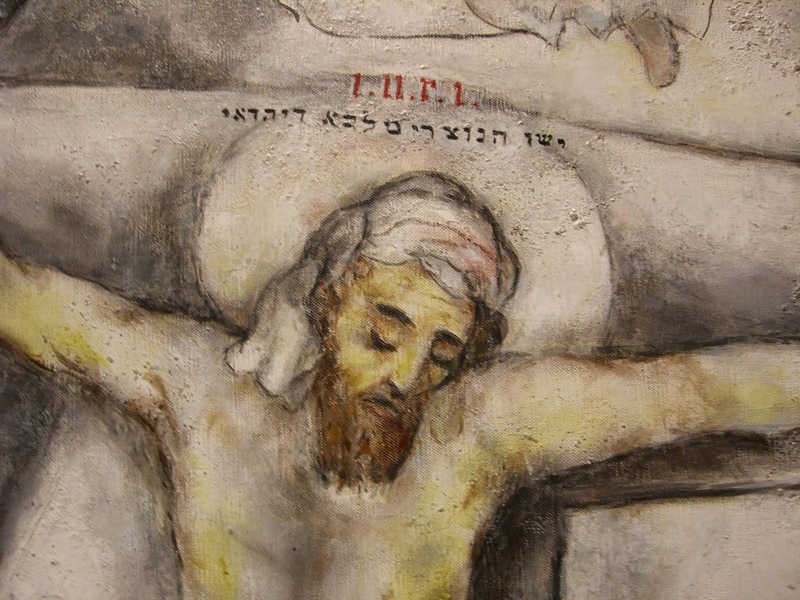 Most Christians will interpret the painting as displaying a direct link between Jesus' suffering and Jewish persecution during the Holocaust, according to Pawlikowski. But that can lead Christians to identify "themselves as victims, especially of the Nazis, rather than as a community of faith that contributed to Jewish suffering over the centuries," he said. "The painting, as moving as it is, can send an inaccurate message." "May his name and his memory be wiped out"
"When representatives of the American Jewish Committee met recently with Pope Francis at the Vatican, we presented him a copy of the Jewish Museum exhibit book inside an artistic and inscribed box. We showed him page 105, where a print of “White Crucifixion” is included because of its relevance to the exhibit.The pope was moved by our recognition of his emotional connection to the painting, and responded with a joyous smile." Don't think the Novus Ordo church is ignorant of this. It has adopted the rabbinical sorcery and the saintings of John Paul II and John XXIII are the most recent practice of this magic. With a sleight of hand and an assist from the rabbis, the Vatican hierarchy has made the Novus Ordo church's faith start with the poisonous Second Vatican Council. Now through this infallible act catholics throughout the world are commanded to pray to two heretical saints. By the time Francis gets finished with his reign in the Vatican, the Novus Ordo church will resemble a synagogue and the Vatican a shtetl. "But yet the Son of man, when he cometh, shall he find, think you, faith on earth?" Please say take a moment to say the Act of Reparation for Blasphemies Uttered Against the Holy Name or one of these prayers (click here) in reparation for this most grievous sin against the Most Holy Name of Jesus the Christ. "may his name and his memory be blotted out." No crown of thorns for Our Lord, instead a turban and blasphemous YESHU above his head. Close-up of Chagall's painting in which YESHU can clearly be seen. Counterfeit Novus Ordo with its counterfeit liturgy and secularised sacraments. It used to be each month we saw some scandal or other but now it is everyday. This is a rapidly sinking ship which looks increasingly like a cynical caricature of Christianity. Thanks for linking/discussing my piece, although I'm not sure I followed your post completely. Thanks for writing the piece and your blog as well. Yes thank you so much for your blog. God bless you for exposing these demons. I hope some people will be given the grace by Our Lord to stop wearing their blinders and stop blindly following these agents of the new world order wearing "Catholic" clothing but acting completely Antichrist. For Berg to say he "loves" this when the picture clearly says that Christ's name should be blotted out and he has his big love fest with all those Talmudists at his "last lunch" as you reported last month, the man clearly hates our Lord with only the intense passion a Talmudist can - I say Bergoglio is a Jew and I say it because that is clearly the evidence he presents. Sherlock Holmes would deduce no less. I also say Montini and Wojtyla were. Roncalli wasn't but was in the lodge according to Thirty Days magazine - how the novus ordo memory has forgotten that for their "Good Pope/Saint" Roncalli, Mr. Rosicrucian masonic lodge attender. What Luciani was I don't know, and Ratzinger seems just to be demonically possessed - after he denied the Resurrection and helped Wojtyla to deny Christ as the Messiah, clearly the man has demons operating within him. and the document to which it links. Bergoglio is a judo-phile. And at the same time he despises the Catholic Church. His goal is the total destruction of the Church. The "Mary untier of knots" painting that he loves so much is masonic. The knots in the painting are masonic knots. Untying the knots signifies releasing a magic spell. The "crucifix" he wears around his neck is also masonic. The "good shepherd" can also symbolize the god Hermes, which has great significance for freemasons. In his all his interviews he goes to great pain to let us know his favorite painters, writers, movie directors, etc. All of them are the worst kind of liberals. Many of them are known homosexuals. I am convinced that this was his way of sending a hidden signal to the masonic world that he is one of theirs and that he intends to move forward their plan to destroy the Church. Thank you for this post. It is quite sickening to contemplate all of this. If you are like me then you must feel quite "dirty" after posting this. I have said a Hail Mary for you. Thank you Michael, we greatly appreciate your remarks & prayers! Look for a name of God somewhere. Pilate got it right and Chagall did not. Wow. acrostic. And devout Jews would never write the tetragammon, --but gentile Pilate did. Yeshu is how the Galilean Jews would have pronounced his name (yes, it also doubles as a talmudic acronym...), but the main point is that Yeshu is a perfectly fine rendering of the name. is blasphemous. That's what Pilate did write on the inscription!